In 1976, the company Emil Adolff Plastic GmbH & Co KG, based in Reutlingen, Germany, assigned some of their in-house developers with the task of developing products and systems as part of an innovation and diversification study. The products and systems were to demonstrate the potential to add an additional mainstay to the companys operations as providers of piping and yarn carriers within the textiles industry. During the period from 1976 to 1978 this team of employees were able to develop four new systems. Considered in isolation, the first prototypes of QUADRO had already been developed in 1977/78 and tested in 16 German nursery schools, with the close cooperation of "TÜV Deutschland", the German technical inspection authority. The results were extremely positive and, although completely new ground for the TÜV, led to the certification of the system. In mid-1979 QUADRO (brand name, production means, patent rights, utility models, moulds, trademark, other trademark rights), being a toy product intended for recreational use by children, was split off from the other 3 systems and from Emil Adolff Plastic GmbH & Co KG and the subsidiarycompany Emil Adolff Plastic GmbH due to financialreasons. QUADRO, however, continued to be produced,packaged and stored by Emil Adolff Plastic GmbH untilthe 1980s. 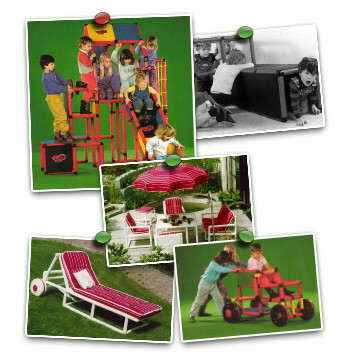 Following its initially huge success at the toytrade fair in Nuremburg in 1979, Quadro was seen not only as a product for one market, but rather as a system for several markets across the entire recreational sector for children and adults alike, at home, in the garden, indoors and outdoors. 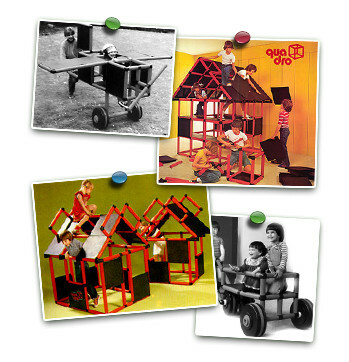 QUADRO, a brand new toy, and the world's first construction kit to consist of just 12 basic elements, was born! Even today, not much has changed in this basic system. From 1979 to the present day, new developments have led to the addition of particular features or adjustments to meet toy safety standards. Since 2004, QUADRO Holding / Sued Ltd. and recently the QUADRO DER GROSSBAUKASTEN GmbH based in Hamburg, Germany, has been responsible for the further development, production and marketing of QUADRO. Concerning the System toy QUADRO and with a view to a forceful protection of the QUADRO Trademarks with emblem and lettering, all of the worldwide existing Patent rights, Trademark rights, petty patents, design patents, etc., were bought between 2010 and 2011 from QUADRO Holding / Sued Ltd..
More information about the history of QUADRO THE GIANT CONSTRUCTION KIT please find on www.facebook.com/quadro.